CIRCA 1918 - Segregated units of American soldiers work to douse a barracks fire in Souilly. 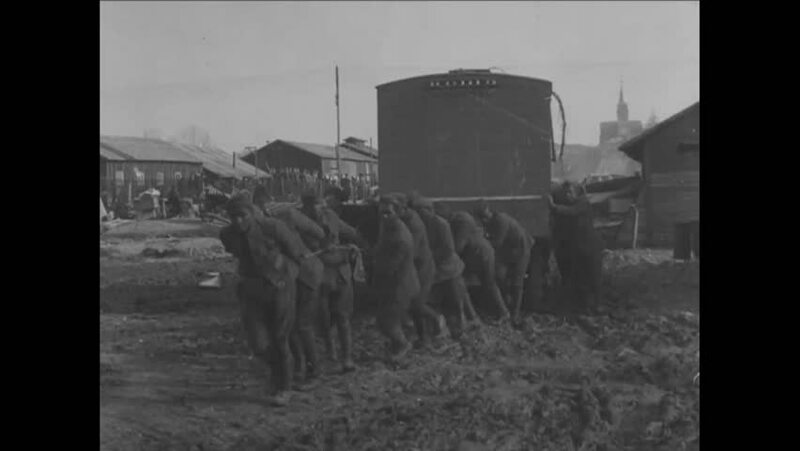 hd01:19CIRCA 1918 - Soldiers move out on a train loaded with provisions. hd01:02CIRCA 1918 - German POWs are marched through rubble from the St. Mihiel Offensive in France in WWI. hd01:10CIRCA - 1918 - The rubble of the village of Boeschepe, France, and soldiers painting white crosses in Abeele, Belgium, during WWI. hd00:21HIROSHIMA, JAPAN 1940s: The repercussion of the atomic bomb on Hiroshima and adjacent areas. hd03:05CIRCA 1910s - Hydroelectric power in 1918.
hd01:36CIRCA 1940s - The aftermath of Hiroshima after an atomic bomb is dropped on it in 1945.